By buying this product you can collect up to 342 Yachtaid Points. Your cart will total 342 points that will be converted into a voucher towards your next purchase! Must be logged in to collect points. 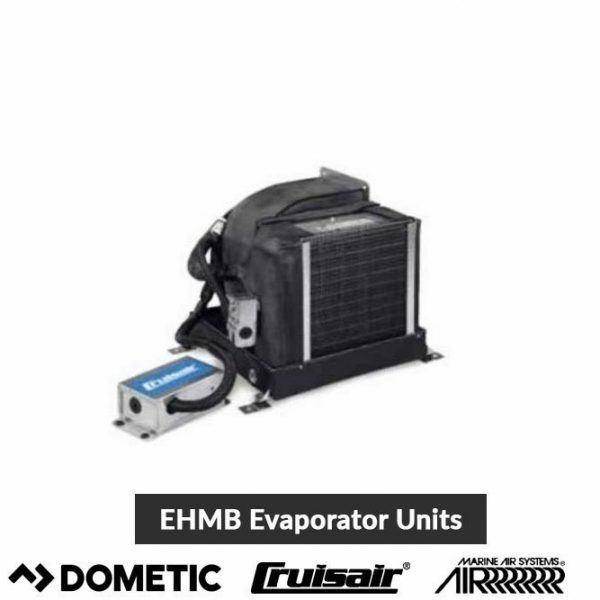 Marine Air Cruisair, 4,000 | 6,000 | 8,000 | 10,000 | 12,000 | 16,000 BTUs modulating evaporators are ductable cooling only (EMB) or cooling with electric heating (EHMB) units with built-in refrigerant solenoid valves and high-efficiency blowers. Cruisair modulating air conditioning systems allow up to five independent temperature-controlled zones on one RM type modulating condensing unit (see spec sheet L–2366). EMB and EHMB units are designed to be installed low in a closet or cabinet, with discharge air ducted to grilles high in the cabin. Units are available in capacities from 4,000 to 16,000 Btu/hr. EMB models are cool only while EHMB feature electric heat with high-temperatureinsulation to meet ABYC requirements. All metal surfaces over which air passes are covered with insulating foam to reduce secondary condensation and noise. The condensate pan has an anti-slosh, antifungal foam lining and rubber mounting feet for noise and vibration control as well as easy installation. The high-efficiency blower can be rotated so the air can be discharged in different directions. The permanent split capacitor (PSC) motor is internal to the blower wheel and housing, which results in a quiet unit with excellent performance and speed control, especially when used with a Cruisair SMX series control. An electrical junction box is included with the unit, and has a 3′ (1 m) wire harness so it can be mounted in an accessible location. EMB and EHMB cooling units can be controlled locally with a mechanical switch assembly, SMX II microprocessor† , or the new Q-Logic with Qht or Q3 display.